September 29, 2016 – HOBOKEN, N.J. — A NJ Transit commuter train plowed through the barrier at the end of the tracks and crashed into a wall at the terminal killing one person, injuring more than 100 others and unleashing chaos as part of the station’s roof came tumbling down in a jumble of metal. This accident hurled commuters around on the crowded train and created enough force to knock bystanders to their knees, transforming a historic station into a disaster area around 8:45 a.m. 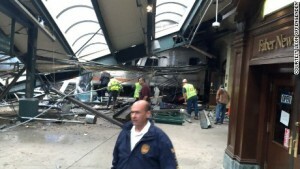 The person who died was a woman standing on the platform, who was hit by falling debris. Officials said they had not determined why the train, which was carrying an estimated 250 passengers, was traveling at a high speed and failed to halt on the track. The crash sent passengers flying out of their seats in a violent tumble. Then the lights cut out. Shouts and cries underscored the sense of panic. And after passengers managed to escape from the train, many crawling through its windows, they emerged to find the station a mess of metal beams, smoke and treacherously hanging wires. Water poured from ruptured pipes. The most seriously injured were carried out. Others emerged on their own with blood staining their clothes. A New Jersey Transit worker said a train is typically supposed to come to a stop about 10 to 20 feet in front of the bumper. Its speed limit while entering the station is 10 miles per hour. Instead, this train barreled over the bumper and onto a concourse, coming to rest at a wall near the station’s waiting area. The train’s engineer, who was released from the hospital, was Thomas Gallagher, 48, according to Nancy Snyder, a spokeswoman for New Jersey Transit. Mr. Gallagher has worked for New Jersey Transit for 29 years, Ms. Snyder said. “An extraordinary tragedy,” Gov. Chris Christie of New Jersey said, flanked by Gov. Andrew M. Cuomo of New York and transportation officials at a news conference near the station on Thursday afternoon. In all, at least 114 people were injured in the crash, a flood of victims sent to hospitals that forced at least one to set up a triage area for some patients in its cafeteria.